This dessert was created by chef Frank Leake years ago, and has long been loved by residents and staff. 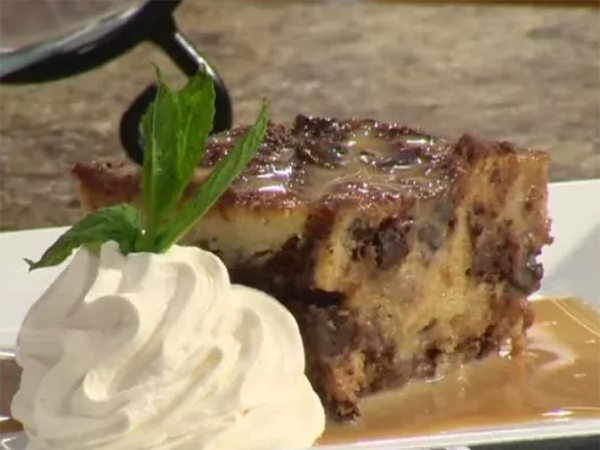 But it wasn’t until it won the Taste of Pikesville competition that the bread pudding rose to fame and became very special. For cream sauce: Mix all sauce ingredients well. Add to double boiler and simmer for 30 minutes. Thicken with 1 cup water and 1/3 cup cornstarch. Bring to high heat and stir constantly for 5 minutes. For pudding: Mix butter, sugar, vanilla, milk and eggs in a bowl. Fold in bread and chocolate chips. Pour batter into a greased 6-by-9-inch pan. Bake at 325 F for 45-60 minutes.